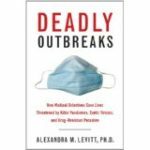 Levitt - Joelle Delbourgo Associates, Inc.
Alexandra Levitt, the author of Deadly Outbreaks, is a health scientist at the Centers for Disease Control and Prevention (CDC). She received her graduate training in biology at Columbia University and her post-graduate training at the Albert Einstein College of Medicine. As an Assistant Professor at New York University School of Medicine in the 1990s, she studied the molecular biology of malaria parasites and lectured on the use of DNA probes in diagnostics, epidemiology, and vaccine research. She also spent a semester as a Visiting Professor at the University of Sao Paulo, and traveled to the Amazon city of Porto Velho, Rondonia, to gather parasite specimens to take home to her laboratory in New York. At the time, research on tropical diseases like malaria–which kill millions of children in poor countries every year–was not a priority for the United States. During a phone meeting to discuss her research grant, an official from the National Institutes of Health, she was challenged to come to Washington to help change national policy. The following year, Dr. Levitt became an American Association for the Advancement of Science (AAAS) Diplomacy Fellow assigned to the U.S. Department of State, where she coordinated a government-wide review of the global threat posed by emerging infectious diseases, including new, drug-resistant, and re-emerging diseases. That review became the basis of a new U.S. policy on infectious diseases, laid out in a Presidential Decision Directive (http://www.fas.org/irp/offdocs/pdd_ntsc7.htm). The new policy led to greater U.S. engagement on global health issues and contributed to today’s emphasis on putting control of diseases that cause poverty and economic stagnation (e.g., malaria, AIDS, and TB) at the center of development efforts in poor nations. The idea for Deadly Outbreaks—a book of real-life outbreak mystery stories—came from the Council of State and Territorial Epidemiologists (CSTE), the national society of medical detectives (formally called “field epidemiologists”). CSTE was looking for a way to showcase medical detection as an exciting and rewarding career for students interested in science and math. Dr. Levitt was approached by Patrick J. McConnon, the Executive Director of CSTE, who offered to tell her an outbreak story he had never told publicly before. Working in Bangkok in the 1980s, as the CDC official responsible for oversight of heath issues at refugee camps in Southeast Asia, he learned that a group of Cambodian refugees about to leave the camps after many years were suffering from a rare, drug-resistant form of malaria. He told Dr. Levitt an amazing story about his race against time to investigate this dangerous form of malaria and ensure that the disease did not spread out of Thailand. That story—which became Chapter Two—inspired Dr. Levitt to begin collecting other unusual outbreak tales to include in Deadly Outbreaks. Intelligence Service (EIS) and at state and local health agencies. It is a timely reminder that the battle with infectious diseases and other outbreaks is an on-going struggle, as epidemiologists in each age are challenged by newly-emerged pathogens, newly-realized pathways for old pathogens, and other unpredictable surprises. And for all the welcome and powerful new tools of computers, faster communications and more sophisticated statistical techniques, we see how much still depends on inquiring minds and dogged determination.